Nutella is the brand-name of a chocolate and hazelnut spread created in the 1940s by the Italian company, Ferrero (also known for their Ferrero Rocher sweets). 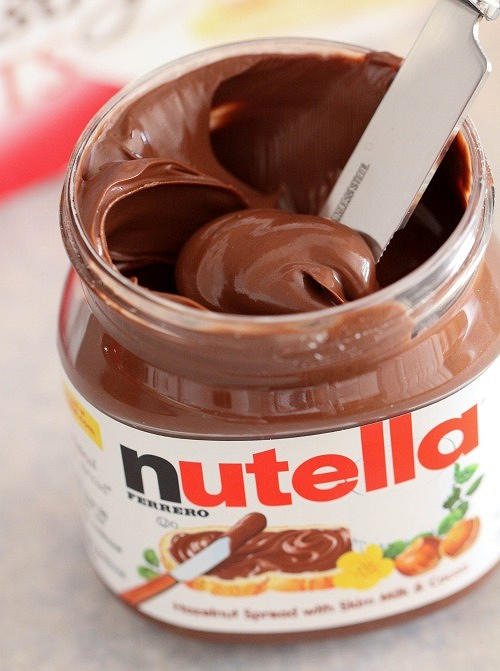 Nutella is used as a spread on sandwiches and on other food items. Worldwide, the spread outsells all brands of peanut butter combined. In Italy, Nutella has become a cultural and social phenomenon. Many books have been written about it, and it is the core of a celebrated scene in the movie Bianca, by the Italian filmmaker Nanni Moretti, in which a character relieves his post-coital anxieties by eating from a gigantic jar. It is also very popular in the rest of Europe, in Australia, and Brazil, mostly with children and teenagers. This is less true in the United States, where the product was only available as an expensive import until the 2000s. In the United States, basketball star Kobe Bryant was a former spokesman for Nutella, having grown up in Italy. In addition to be being a sandwich spread, it can be used as a flavouring ingredient in baking. Mixing it with whipped cream creates a filling for cakes and pastries. In many European cities like Paris, crêpes filled with Nutella spread and sliced fruit, often either bananas or strawberries, are popular snacks available from food vendors on many street corners. In many parts of Italy where bread festivals take place annually, stands offering different types of bread can be seen with jars of Nutella to spread on the slices offered to people attending the festival. Nutella is the most readily available form of gianduja, which is a blend of chocolate and hazelnut paste developed in Italy after excessive taxes on cocoa beans hindered the early development and production of conventional chocolate. Gianduja is produced by many European chocolate manufactuers and is normally sold in solid blocks and not as a spread. Despite the economics which drove its invention, gianduja is definitely not an inferior compromise to chocolate, or a chocolate substitute, and while Nutella is the most popular form of gianduja there are many varieties which rival the highest quality chocolates in both price and quality. The ingredients listed here are from the US packaging. Listed by decreasing weight: sugar, peanut oil, hazelnuts, cocoa, skimmed milk, reduced mineral whey, partially hydrogenated peanut oil, soy lecithin, vanillin. - The spread was initially named "Supercrema Gianduja", and was so popular that in the aftermath of World War 2 Italian stores offered a service called "smearing", which allowed local children to bring in a slice of bread on which they could have some Nutella spread. - Ferrero changed the name from "Supercrema Gianduja" to "Nutella" in 1964. - Italy produces 179,000 tons of Nutella every year. - Although the ingredients are well known, the exact recipe is kept "as secret as Coca-Cola's". - In Europe the Nutella jar is usually made of glass, whereas in North America it is made of plastic. In Italy and southern France, 3 and 5 kilogramme (6.6 and 11 pounds, respectively) jars are available for sale.